In a large saucepan or Dutch oven, heat the oil over medium heat. Add the onion, carrot and celery. Season with salt and pepper. Cook, stirring frequently, for 5 minutes until the vegetables are soft. Increase the heat to high and add the beef and garlic. Cook for 3 to 4 minutes until the garlic is fragrant. Stir in the tomato paste until combined. Add the broth, braising liquid, tomatoes and beans. Bring the mixture to a boil. Reduce the heat to a simmer and cook until the liquid has reduced by a quarter, about 30 minutes. Remove the thyme sprig and discard. 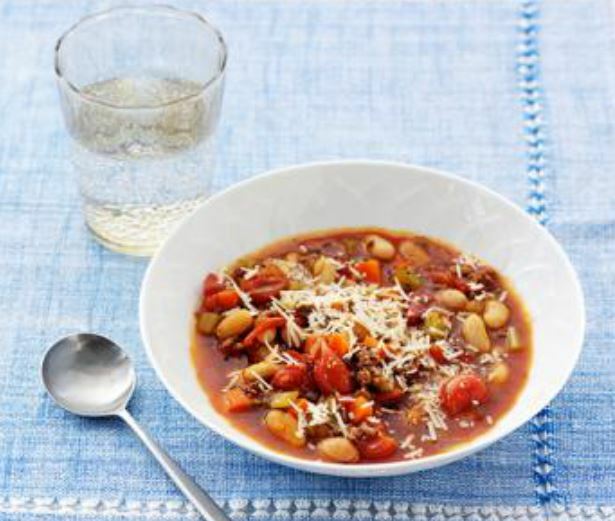 Ladle the soup into bowls and garnish with parmesan cheese.